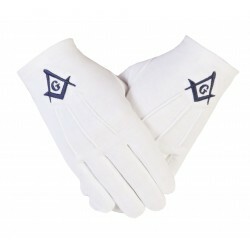 Freemason Masonic Gloves in Cotton in Navy Blue SC&G. 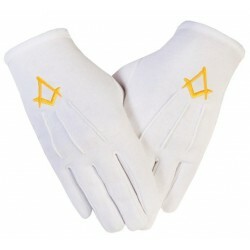 Newly launched Gloves for Freemason Company specialised in Cotton and real Kid Leather Gloves with various embroidered symbols. gloves are symbols of innocence and purity of heart. 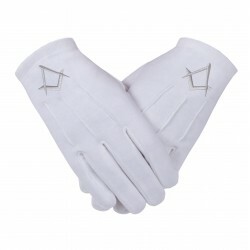 We make high quality cotton gloves and kid leather gloves. 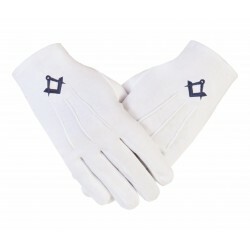 Our gloves come in plain cotton as well as with machine embroidered symbols. Kid leather gloves are available plain or with either machine or hand embroidery. For a small set-up cost and a minimum order 36 pairs, we can supply almost any symbol to your own design or specification in any size from XS to 3XL. We are pleased to supply the trade and we also supply Provinces with their own embroidered range. We are currently expanding our range of products to include kid leather gauntlets for the Knights Templar and KBHC, high quality Master Mason Aprons, and soft apron bags in both Cordura and real leather. We are a small company but versatile enough to value the smallest order from individual customers at the one end and large orders for established Masonic trade suppliers at the other.